Last Updated: December 31, 2015 | Subscribe to our weekly newsletter! Chlorine and Bromine are great ways to sanitize your hot tub, but many people don’t like to use these chemicals. However, while many are okay with using them in their pools, they don’t enjoy using them in their hot tub. 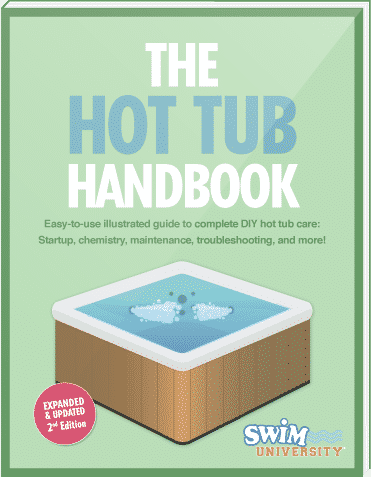 After all, a hot tub isn’t a mini swimming pool, and it is used for very different reasons. While you enjoy a soak, you may not want to deal with some of the drawbacks of using bromine or chlorine as your sanitizer. There are many reasons that people prefer to go the alternative route when cleaning their hot tub. Let’s take a look at a few of the reasons that might convince you that other sanitizers are a perfect route to take. First, many just don’t like that chemical smell that mainstream sanitizers give off. You know the smell I’m talking about. Sure, to some it smells clean, but to others, the smell is harsh and doesn’t mesh well with a relaxing hot tub experience. The traditional sanitizers can often irritate the eyes making them feel dry and scratchy and even appear red after long soaks in your hot tub. If you don’t want to experience these eye symptoms, you must look for an alternative sanitation solution. Some people are just more sensitive to these chemicals than others. Regular bathing in a hot tub can irritate the skin if standard chemicals are used making for a very unpleasant hot tub soak. Have ever seen hair color change when soaked in chlorine for an extended period of time? Not a pretty site. It can also do a number on your clothes if you wear them ;) in your spa. Alternative sanitizers won’t have these damaging effects, so if you use your hot tub a lot, it makes alternatives much more attractive. Now to the good part. Let’s take a quick look at four different sanitizer alternatives that can reduce or even eliminate your dependence on chlorine or bromine for your hot tub sanitation needs. The sun is an amazing source of bacteria killing. Who would have thought? In ultraviolet systems, the water is passed through a tube with UV bulbs, the radiation produced by these bulbs kill everything in its path with ease, making it the perfect sanitizer. Sounds great doesn’t it? However, while your water will be free of contaminates, this system won’t help the clarity one bit. You will still need to shock it and you maybe even have to use chlorine or bromine to do it, but at least you won’t have to use as much. Ionizers work by releasing copper and silver ions into the water. These ions are capable of killing all bacteria and algae in the water while remaining safe for us humans to enjoy a soak. Using these ionizers makes balancing the acidity of your water even easier but you will still have to shock the hot tub occasionally because it won’t prevent clouding. You will also have to change the ionizers periodically as the ions get depleted. Just like the ozone layer surrounding the Earth, ozonators inject ozone into the water in order to sanitize it. These sanitizers are actually 3000 times more effective than traditional bromine or chlorine, making them a great alternative for anyone looking for something a little different. Ozonators are made in all shapes and sizes based on the size of the hot tub, or even pool, in which they will be used. However, going this route means that you will have to invest a little money and you may even have to modify your hot tub for it specifically. Still, if you are looking for a long term solution to replacing chlorine or bromine, this is a great solution. The technical name for this chemical is polyhexamethylene biguanide. It is well known for being very gentle on the eyes and skin while still being a very effective sanitizer. Even some contact lens solution is made with this chemical in it. The downside is you will still need to shock with a non-chlorine or non-bromine based shock, and you cannot mix it with chlorine at all. That means if you don’t like the way it works it will be difficult to switch back later. While chlorine and bromine are great at cleaning your hot tub’s water, they often leave a chemical smell that many don’t like and it can even irritate your eyes and skin. Switching to an alternative to these sanitizers can easily make your hot tub soaks much more enjoyable, although you need to be careful. Each of the alternatives has their own strengths and weaknesses. It is important to understand this before you make the switch, or you may not be happy that you did. However, with just a little work on your part, you can reduce or eliminate your reliance on traditional sanitizers completely in your hot tub.